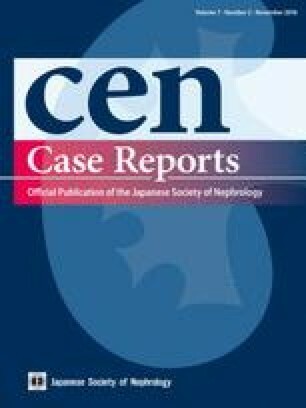 A recent systematic review showed that hematological malignancy is often complicated by membranous nephropathy (MN). Histologically, the deposition of IgG subclasses other than IgG4 may imply secondary MN, such as malignancy-associated MN (M-MN). We describe a very rare case of concurrent isolated IgG2-positive MN and B-cell lymphoma. An 83-year-old woman was hospitalized at our institute for facial and lower extremity edema persisting for 2 months. Laboratory tests showed urinary protein level of 10.8 g/day, serum albumin level of 1.6 g/dl, and serum creatinine level of 2.34 mg/dl. Soon after diagnosis of nephrotic syndrome, treatment with corticosteroid was initiated, but it proved to be ineffective. Renal biopsy showed isolated IgG2-positive MN with highly infiltrated CD20-positive lymphoid cells in the kidney. Computed tomography revealed systemic lymphadenopathy, and aberrant B-cells with immunoglobulin light chain restriction were detected in peripheral blood and bone marrow, which led to the diagnosis of mature B-cell lymphoma. Although rituximab (375 mg/m2/week) was administered, the patient suddenly died from gastrointestinal bleeding on day 40 of hospitalization. It is, thus, necessary to consider hematological malignancy when a diagnosis of MN is made. Further studies are expected to elucidate the pathogenesis and to help establish the adequate treatment for this rare situation. We appreciate Ryoko Saito for valuable advice on pathological findings and Kiyomi Kisu for her technical assistance.